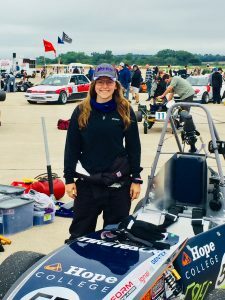 Morgan Dalman (’19) and Hope’s 2018 FSAE car at the SCCA Solo National competition. Members of Hope College’s formula SAE team recently returned to Lincoln Airpark in Nebraska, which was the site of their 11th place finish in the June, 2018 FSAE competition. This time they were in Lincoln to participate in the Sports Car Club of America (SCCA) Solo Nationals competition. The SCCA competition attracted nearly 1,400 drivers this year, making it one of the largest racing events in the world. The event attracts primarily amateur drivers, though a few professionals also race. The competition took place on two autocross courses, which are racetracks made of cones. The drivers compete in their car class for the quickest combined time of the two courses without drawing time penalties for hitting cones. Students Morgan Dalman (‘19), Jarret Matson (‘19), Jack Heideman (‘20), Theo Roffey (‘21) and the team advisor Carl Heideman were the team’s representatives. After walking the track about 10 times, the races started. The course walk is a major part of autocrossing because the drivers are not allowed to test the course in a car prior to the race. Therefore, being able to dictate speed and line is an important skill. 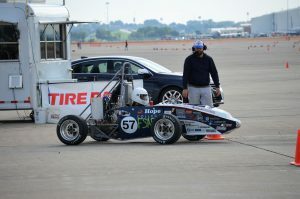 The SCCA tracks were setup to run much faster than a typical FSAE competition, which allowed the team to test their vehicle closer to its upper performance limits. Morgan Dalman (’19) prepares to complete one of the two autocross courses. The team’s drivers, Morgan, Jarrett, and Jack put down very respectable times on both courses. On the first course many drivers in cars similar to the Hope car finishes in 63-65seconds, while Hope’s drivers clocked in at 63 second or better. More importantly, the competition provided a lot of new information and experience necessary for enhancing the car’s performance. For example, the team learned from the driver of an A-mod style racecar that changing tire pressures from 10 psi in front and 8 psi in rear to 15 psi in front and 13 psi in the rear would provide much more grip on concrete surfaces compared to the grip on asphalt surfaces. The team was also able to meet many people who were formerly or are currently involved in FSAE, including, recent graduates, knowledgeable advisers of current teams, and representatives from companies that support other teams. Each contact provided helpful insight on the car and team dynamics. Overall, the team learned a great amount at Solo Nationals and hope to return there next year and many more years to come. 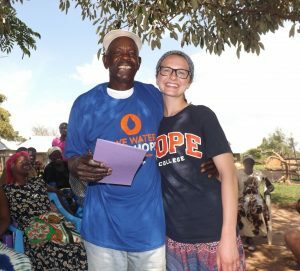 On March 14th, five student members of Hope College’s Engineers Without Borders chapter (Kayty Ihara, Andrew Caris, Matthew Dickerson, Owen Donahoe, and myself, Jenny Pedersen) began a 10 day trip to Bondo, Kenya. We were accompanied by two mentors Nick Frank and Joe VanBennekom. 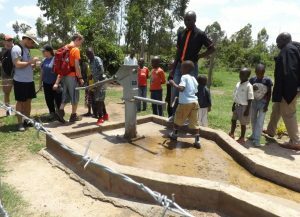 The purpose of the trip was to monitor wells and a rain catchment system that were installed by the chapter in a rural community in Kenya during the summer of 2017. The team arrived in Nairobi on March 15th at 9pm and stayed at St. Paul’s University overnight. On the 16th we took the 8 hour journey to Bondo. Upon arrival we met Charles, a Kenyan native that was kind enough to let all seven of our chapter members stay on his property. During the week, we spent time in the Bondo community conducting surveys about water accessibility, usage, and storage practices. We also collected water quality samples from the wells and the rain catchment system to verify the systems were still functioning properly and providing clean water to the community. All of the water quality tests showed that the water is clean and suitable for drinking! Something I learned during this trip is how much we take water for granted, I always knew we use a lot of water in the US but it really hit home when I saw the journey that people take just to get water. Additionally, I learned how important it is to be grateful and generous. The community members were so welcoming and willing to give what little they had. It was an extremely eye opening experience to see the joy and gratitude that the local Kenyan culture displayed, even for small blessings. To be immersed in a different culture was an amazing experience that helped me gain perspective on my own life. It was a great reminder of how present God is and how he provides no matter who or where you are, and that you can either let a situation define you or let your faith define you! I believe this trip will impact my life going forward as an engineer by reminding me of what goals are important to work toward. For me, that is ultimately helping others through my engineering practice and giving every person I meet the love and respect they deserve. Not only does this trip remind me to count my blessings and be thankful for whatever my future career may hold, but it also reminds me to appreciate the different kinds of people I will interact with in the workplace. To students considering trips like this, I would say GO! If it is with Engineers Without Borders, or even an immersion trip, I think it is so important to experience different cultures to try to truly understand what fuels them! Meghan Estochen (’08) graduated from Hope College with a Bachelor of Science degree in engineering with an emphasis in chemical engineering. After graduation, she worked for two years as a materials engineer specializing in adhesives for a Rochester, New York based company that made optical units for satellites. Meghan then moved to Albuquerque, NM to take a Manufacturing Engineering position with SolAero Technologies, which specializes in making solar cells and solar panels for space applications. 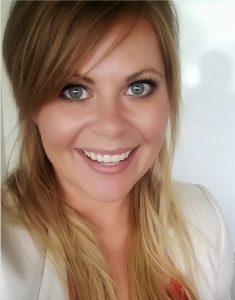 In her time at SolAero Technologies Meghan has held positions of increasing responsibility including Configuration Manager, which over time expanded to include managing the Drafting team, and the Manufacturing and Test Engineering Manager for the solar panel product line. Currently, she is the Manager of Continuous Improvement, working with the entire organization to make strategic, Lean driven improvements. As the Manager of Continuous Improvement Meghan seeks to challenge the status quo every day. Her job is to ask “why?” and “what can we do better?” and then guide teams of hardworking, dedicated individuals to achieve great improvements. She teaches critical thinking, implementation of solutions, and how to always search for better ways to do things. This is applied in all areas of the business: production, engineering, supply chain, finance, corporate, etc. The primary tools used to generate improvement are derived from Lean Six Sigma, Toyota Manufacturing, and others methodologies that believe the strength of the business is in the creativity of its people and its willingness to constantly change to remain an industry leader. She also operates as a special projects manager using Scrum methodology for system implementation efforts and is a champion of corporate culture. 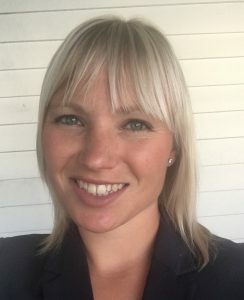 She is grateful for and passionate about her incredibly unique role within SolAero. The following are excerpts from a recent correspondence with Meghan. The work that I do ties directly to the mission of the organization and the programs it supports, and that motivates me every day. The first project I worked on was the solar panel array that took the Mars Science Lab to Mars. Our company powers satellites that provide early warning for natural disasters, satellites that provide entertainment like Sirius Radio, satellites that explore deep space. We will be powering the closest exploration of the sun with a satellite that will travel at 125 miles/second. We will be powering satellites that will give internet access to the world, starting with schools in third world countries. More than 40% of the power in orbit today came from SolAero Technologies. The impact of my work is vast and meaningful. It is a privilege to be a part of something so exciting. During my time at Hope, my technical degree was balanced with my Greek Life involvement. My senior year marked a significant ramp up in my leadership roles in Greek Life. I was the president of the Dorian Sorority, VP of the PanHellenic Council, and started the Greek Women: Making the Ideal Real initiative. I would not have been able to be so active and push for so much positive change during that year though, had it not been for the friendship with and mentoring from Ellen Awad. Her commitment to my development as a leader taught me what meaningful mentoring should look like and it has been something I have continued to leverage in my professional career, both as someone who always looks to improve and as someone now positioned to mentor others. I cannot say enough about how Ellen helped prepare me for a blossoming and fast-tracked career, maybe without even knowing it. Seeking mentors who are willing to invest time in your development and give you honest feedback is what will inevitably help anyone advance to where they want to be. 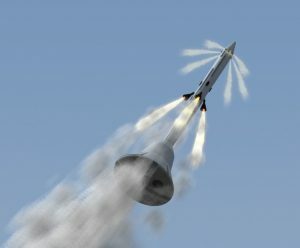 Engineering design is the course that I have been able to apply most in my career. It included elements of design, experimentation, prototyping, and project management. It allowed for creativity, while teaching project management skills. It also provided an avenue for large public speaking forums. Today, I find myself delivering presentations to the entire 300-person organization very comfortably, and I know that started at Hope with the opportunities to present to other students, faculty, and community members. There is a joke often made that engineers are a socially awkward breed. And I believe I can geek out with the best of them! But often when this joke is made around me, people tack on “…but not you, we know you are an engineer, but you are an exception to the socially awkward rule.” This always makes me laugh. I believe that this is what a liberal arts education does for those who might naturally tend towards one very technical avenue. It makes us well rounded, relatable people, capable of integrating into a business world filled with many types of people. This will only help a career in an increasingly globalized market. Get involved. Don’t be afraid to take chances and take leadership roles. Push yourself academically and in your extracurricular activities. Value each experience for what you can learn from it and how it will shape you. You will one day look back fondly and be able to see how your Hope experience has made you into the success you are guaranteed to be. And if your career path is anything like mine, where you end up will be wildly different from what you anticipated. Kurt Blohm (‘06) is currently an applications engineer at Applied Biomimetic, a company based in Cincinnati, OH, with a unique focus on the development of membranes for water treatment and filtration systems. Kurt graduated from Hope College with a Bachelor of Science degree in engineering with an emphasis in chemical engineering. 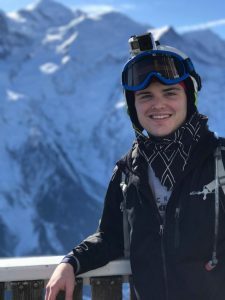 He started his career at ERG, an environmental consulting firm, while also working to obtain his Master of Science degree in chemical engineering at Ohio State University, which he completed in 2010. Kurt has enjoyed a wide variety of experiences including working as a process engineer at an ethanol plant (Valero Renewables), working for a water treatment startup company (Advanced Hydro), and working as a scientist focused on research and development (Battelle). Kurt Blohm at work. 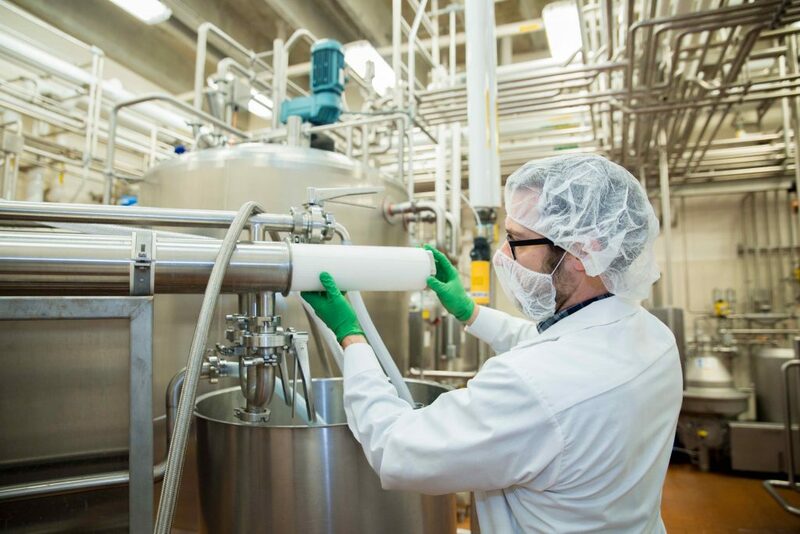 Photo courtesy Applied Biomimetic, Inc.
Kurt describes himself as a chemical process engineer, but his role also includes a healthy dose of sales and business development. In his current role, he travels regularly to customer sites to develop new applications for Applied Biomimetic’s filtration products. 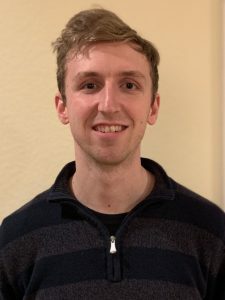 His diverse responsibilities also allow him the opportunity to perform research and development work in a laboratory setting, and to design, build, and operate pilot systems to evaluate the success of Applied Biomimetic’s membranes in separating various flow streams. The following are excerpts from a recent correspondence with Kurt. I’ve had a range of experiences, from process engineering to R&D and now business development. On any given day, I could be programming a PLC [programmable logic controller], studying protein separation/purification in the lab, or in another country talking to customers. I’ve also had the opportunity to develop my own novel ideas as I have several patents pending in the area of seawater desalination from my time at Battelle. This versatility is a big part of who I am, not just professionally, but personally. Engineers without borders was an amazing experience. It helped me realize the value of my education and grew my interest in water and energy. 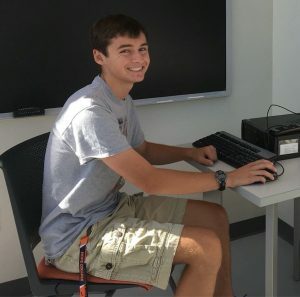 The summer research program is a great way to gain experience and get to know your professors’ research interests. The professors in the sciences are truly top notch. Dr. Misovich was a great mentor and example to me. I could say equally great things about the rest of the faculty, but I had the most exposure to Dr. M.
I think Hope College engineers have a sense of community that I don’t see at other institutions and the same goes for the sports teams (I was on the swim team at Hope). Liberal arts colleges draw that kind of person, but Hope College students are especially community and service oriented. Don’t be overly concerned with grades. If you have a weak subject or two, learn the main concepts and move on. Get hands on experience as soon as possible, through internships or for example, working in construction. For chemical engineers: I firmly believe every career chemical engineer should work as a process engineer at a refinery or production plant for some time (or, for example, as a shift supervisor). You should know the plant inside and out by the time you leave – every valve, pump, vessel and control loop. Get to know all the operators, mechanics, and electricians on a personal level because and you can learn a lot from their perspective.